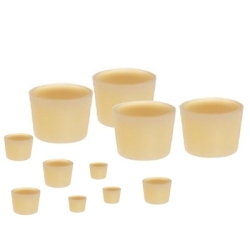 Versilic® Silicone Stoppers 34D - 1.143"Top/1.379"Bottom Dia. x 1.182" High | U.S. Plastic Corp.
Biologically neutral. DIN Standard 18271. Meets FDA/BGA standards. Non-toxic and chemically and biologically neutral. Highly recommended for all tissue culture work. Suitable for temperatures between -94°F and +482°F (-70°C and +250°C). Odorless and tasteless. Non-adherent and resistant to aging. Ideal in biology, micro-biology and hematology, as well as food science, technical, medical and hospital apparatus.